The show was one of the highest rated television shows available to the cable network and well it still is one of the highest rated shows even after months and months of re-runs of the show. The show that I am talking about is “High Stakes Poker” which airs on the “Game Show Network”. What the show is all about is television cameras actually get to sit in and watch an actual high stakes poker game with some of the worlds best poker players who put up hundreds of thousands of dollars of their own money. The show in the past has seen some extremely huge buy-ins to the high stakes game with the minimum buy-in which is $100,000 all the way up to some players actually buying in to the poker game with $1 million of their own hard earned money. Well about 6 months ago it was announced that the “Game Show Network” had decided to bring back the popular poker game for its fifth season but the only problem was they never actually announced any other information about when, where or who would be playing in the popular cash game. Well we have finally got some new information for all of you who have been waiting to hear. The popular show has finally been scheduled to start filming in the later part of December and they have decided to bring the high stakes poker game back to the casino where the show got its start and that casino is the Golden Nugget in downtown Las Vegas, NV. There is still some information that no one really knows yet like who will be actually playing in the fifth season and all anyone has been hearing from the “Game Show Network” is that the viewers will not be disappointed. 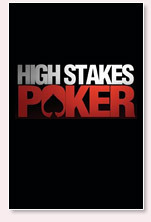 Also some other news to note is that in the earlier seasons of “High Stakes Poker” the minimum buy-in for the cash game was $100,000 and it even saw a $500,000 minimum buy-in towards the end of the fourth season. Well the “Game Show Network” has announced that the minimum buy-in for players for the fifth season of play is going to be a minimum of $200,000 so that can only mean that the viewers will not be disappointed with the fireworks that should come along with the fifth season of “High Stakes Poker”.